A compact, innovative current vector drive, the Yaskawa V1000 industrial AC drive defines a new world standard. With an increase in global competition, plants and similar facility have a greater need for efficient production and better maintainability. Yaskawa offers a smart solution, balancing energy input, product output, maintenance risk, and long life through quality AC drives. The V1000 provides a world of power in the palm of your hand! Unlike conventional Variable-Voltage, Variable-Frequency (VVVF) AC drives, vector drives such as the V1000 by Yaskawa can handle applications that are apt to change suddenly during operation. This is due to the drive’s innovative design that provides direct torque control. The response capability of the typical vector AC drive is 10 times the response capability of conventional AC drives. Vector drives use an electronic regulator to control the direction (speed) and the magnitude (strength) of the magnetic flux in an AC motor. What are your benefits? The Yaskawa V1000 offers all the advantages of a conventional AC drive, plus it’s up to 30 percent smaller than drives from competitors, provides on-line tuning, has a one-touch copy function with verify, offers open loop current vector control, is RoHS compliant, and much more. 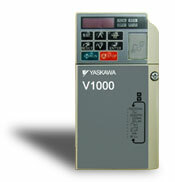 The V1000 AC Drive by Yaskawa comes with a number of options to fit your application needs. Carotron offers one-on-one help if you have a custom application or need assistance with installation. We’re always just a phone call away! Call 1-888-286-8614 to order V1000 AC drives by Yaskawa or to discuss your application needs today. Brochure and Video provided below….